I guess many of you must be interested to pass your time on the Internet by playing Online Flash Games. Many studies even tell that playing games relaxes and eases your mind. So if you are also looking to play some games then I suggest you to try flash games. There are many free flash games to kill your time which needs no additional downloads. You can just visit the site and play flash games until your mind says “I cannot play anymore”. Originally this game is called Diamond Mine. Currently there are many variations of this game. 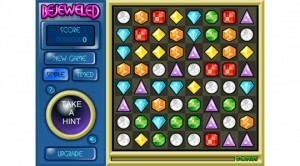 This classic flash game involves moving multi-colored gems or objects around in order to create sets of three or more. You will get extra bonus when you create a set of four or more. It’s a very simple, but incredibly addictive flash game. Bow man is really a very interesting game. Bow Man challenges you to shoot your enemy by calculating the correct angle and the power of your bow. I usually play this game when i’m very angry on someone else. Helicopter Game(Copter Game) is really very addictive. I was playing it from the past 5 years and I never felt like leaving it. Though it looks like a simple game its really very tough to play for a little longer. The aim of the game is to avoid your helicopter from touching the edges. You can simply let it go up by holding left-click and leaving it drops it down. This is a must try flash game.